The radial portable davits of series ŻOP are designed for small cargo handling operations and can be serviced in conditions of vessel's heel up to 5° to either side and simultaneous trim up to 5°. These davits may be stowed in a vessel's store and mounted for handling operations in the choiced place on the open deck whithout any additional equipment. On completion of the handling works, the davit may be disassembled and transported back to the store. 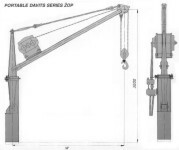 To facilitate such operation, the davit is divided into components of the weight so as the manual transportation, assembly and disassembly would be possible. Slewing of davit is performed by means of manually serviced guy tackles, which are fastened to the jib head. Maximum slewing angle of davit amounts to range from -180° to +180° with regard to its normal working position. The delivery includes the davit of series ŻOP in complete with mounted pneumatic winch type WŻP, riging, block and cargo hook ( as per Customer's order ). WŻP5P - symbol of rope winch with pneumatic drive.